Orlando pet friendly hotels are among the finest in the country. There are many to choose from–88 to be exact. They typically cluster around the theme parks and the convention center. But besides those areas, Orlando is a huge city that’s full of excitement and wonder. Among our favorites of Orlando pet friendly hotels for families, especially with those that include pets, is the Holiday Inn Resort Orlando-The Castle, where guests certainly get the royal treatment. This is the epitome of magic, that is filled with the mystique and elegance of what only the imagination can conjure up in dreams. Perfect for any prince or princess, it’s the perfect family-style place to stay located on International Drive within three miles of SeaWorld Orlando and 12 miles from Walt Disney World Resort. Plus, it is only 2.5 miles from Universal Studios. What a great place to take your family, including the one with four legs! 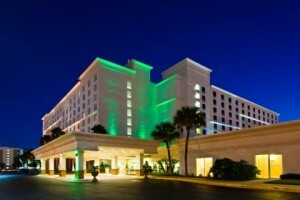 Another of the Orlando pet friendly hotels is one of imaginative architecture and interior delight–the Holiday Inn & Suites Orlando Universal. Although it is close to all the entertainment of the theme parks, it is an adventure of its own. The kids will enjoy its Splash Zone specifically and the hotel is a great choice for organizers to host events, with 11,000 square feet of space. Remember, Vacation Pet Friendly doesn’t just have deals some of the time. Our hotels listings pages display only the lowest rates of any online travel website. While most pet travelers are vacationing, there are some in Orlando on business. Taking your pet on these types of trips is becoming increasingly commonplace. Rotech Healthcare, Martin Marietta and Cues are places corporate travelers want to make sure is in their itinerary. 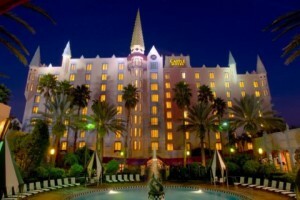 Read more on Orlando pet friendly hotels here. Those traveling with pets have so many pet friendly hotels to choose from, make sure to find one that fits your style. Vacation Pet Friendly has the largest selection with a low price guarantee, so you won’t go wrong booking from here. Once you’ve booked then all you have to do is figure out the fun things to do here. If planning to visit the theme parks, the first two weeks in December are typically the slowest, which in translation means, the perfect time to find sales on Orlando pet friendly hotels. During this time, there it is less crowded, the prices for entertainment are low and, as an added bonus, the hurricane season is over. Often, during this time, fewer rides are closed and the holiday displays and events are everywhere. If your plans include going somewhere that pets are not allowed or if you need some alone time, then make sure to read some of our articles on dog hotels and kennels. Then focus on having a great trip.